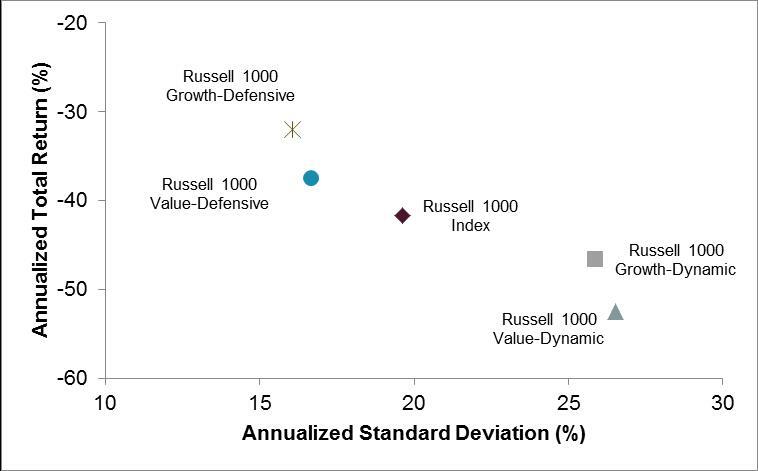 In 2010, Russell introduced the Stability (Defensive/Dynamic) Index Series, which focuses on the Russell-identified “third dimension of style”. The indexes were built on the observation that managers often tend to invest in distinct styles—more stable (Defensive) or more cyclically sensitive (Dynamic)—even while tracking Growth or Value benchmarks. 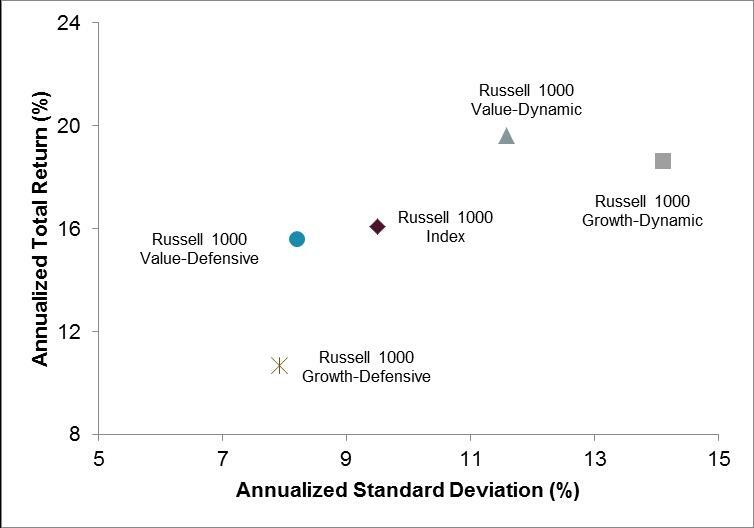 In 2012, Russell integrated these Stability indexes with its Growth/Value indexes, introducing the combined style indexes: Growth-Defensive, Value-Defensive, Growth-Dynamic and Value-Dynamic. So have these indexes complemented existing style indexes, providing investors with greater modularity? Performance data demonstrates FTSE Russell has indeed identified more granular and distinct segments of the market, giving investors an additional tool to assist them in seeking their desired risk/return profiles. We can start by examining the performance of the US large cap style (Russell 1000 Growth and Value) Stability indexes in recent bull and bear markets. As illustrated below, in two recent bull markets the Dynamic index variants outperformed their Defensive counterparts, albeit with higher risk. Source: FTSE Russell, data as at October 31, 2007. Past performance is no guarantee of future returns. Returns shown reflect hypothetical historical performance. Please see the disclaimer for important legal disclosures. The 2002–2007 bull market was driven largely by the performance of financial services companies, which contributed to the outperformance of the Value-Dynamic index. The Growth-Defensive index lagged the other indexes during this period. In the second bull market period examined, that of 2009–2011, a similar pattern is observed, though with higher standard deviation for the Value-Dynamic index, which held volatile companies such as recovering banks. In this period, the Value-Defensive index lagged the other combined style indexes. Source: FTSE Russell, data as at April 30, 2011. Past performance is no guarantee of future results. Returns shown may reflect hypothetical historical performance. Please see the disclaimer for important legal disclosures. By contrast, the Defensive index variants fared better in two recent bear markets. In the 2007–2009 bear market, the financial services sector contributed to the under performance of the Value-Dynamic index. The Growth-Defensive index outperformed the other combined style indexes. Source: FTSE Russell, data as at February 28, 2009. Past performance is no guarantee of future results. Returns shown may reflect hypothetical historical performance Please see the disclaimer for important legal disclosures. In the shorter, five-month bear market in mid-2011, the Value-Dynamic index again under performed the other combined style indexes. 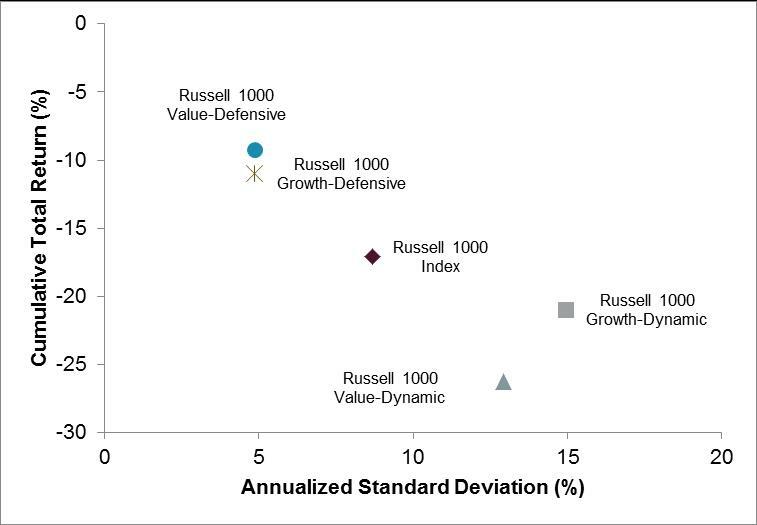 The Value-Defensive and Growth-Defensive indexes again held up better than their Dynamic counterparts or the Russell 1000®. Source: FTSE Russell, data as at September 30, 2011. Past performance is no guarantee of future results. Returns shown may reflect hypothetical historical performance Please see the disclaimer for important legal disclosures. As such patterns emerge in how the Russell Stability combined style indexes have responded to various market conditions, it becomes clear that they can be used for a more granular, targeted benchmark. 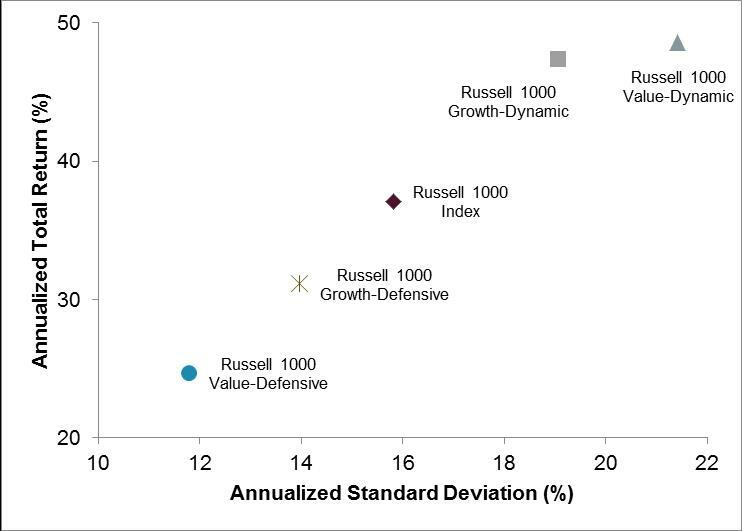 FTSE Russell takes a closer look at this topic in a recently published research paper: Russell Stability Indexes: Performance of Russell 1000 combined style indexes in various market conditions. See D. Hintz (2010), “The Third Dimension of Style: Introducing the Russell Stability Indexes,” Russell Research (December). See D. Hintz and C. Yoshimoto (2013), “Gaining better market insight by combining Defensive/Dynamic with Growth/Value indexes,” Russell Research (February).